When I picked up this bottle of Old 52 supplied soda I had one question. What is a mud pie? My wife said they were treats that composed of chocolate and marshmallows, and then showed me such a treat in the store. “Huzzah!” I thought to myself, or I said allowed in the store… who knows depending on my mood. Then later someone reminded me of a Mississippi Mud Pie which is a super chocolaty pie with chocolate filling and crust. “Huzzah!” I screamed at the top of my lungs, which was rather awkward since we were at the dry cleaners. As you may have guessed, and I’m saddened if you haven’t, today’s soda is mud pie flavored. 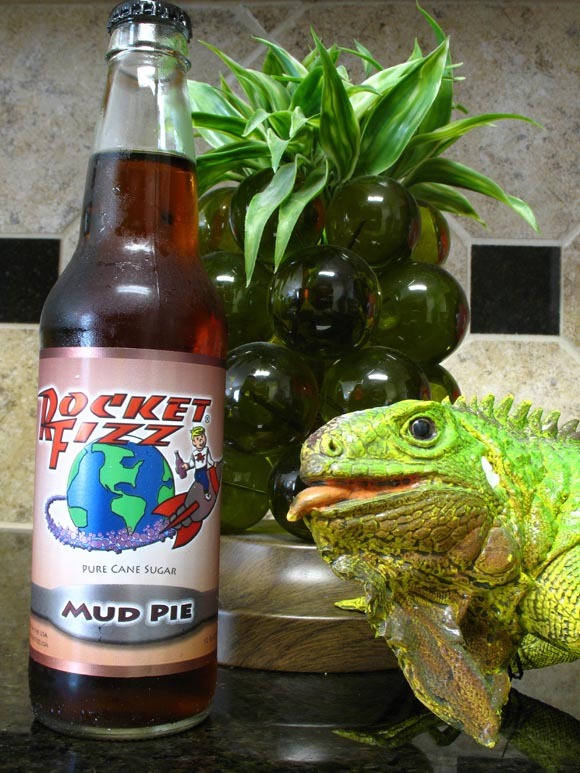 To be more specific the soda of the day is Rocket Fizz Mud Pie soda. Rocket Fizz has surprised me so far in how good their oddly flavored sodas tasted. Today they won’t be able to get the sneak attack on me as I’m ready for this to be tasty. The soda itself is dark amber which give me hope in the amount of chocolate I’ll taste. Older readers, those of you who have been diligent in following us not those of you over a certain age, may remember when we were on the search for a non-diet chocolate soda. Well we eventually found one, but it was pretty hit or miss. Hopefully Rocket Fizz Mud Pie is a more consistent contender. Let’s find out, shall we? I’m a little off put by the lack of chocolate scent hitting the inner workings of my nose. I can smell it, but I really have to pull it in. For some reason I’m getting more coffee than chocolate, but if I remember correctly that’s how S’mores soda started off as well. So all is not lost just yet. On with the tasting! Whelp, I’m saddened. Just as the scent warned this tastes more of coffee, mocha really, than it does chocolate. This is a shame as I’m not a fan of coffee at all. You can tell they didn’t mean for it to taste like coffee as I said it does at least have the rumblings of mocha. If this was truly a coffee soda I wouldn’t still be drinking it for this review. I’m pretty sure the review would say “Gross. Coffee Soda. Run Away”. I’m not really sure why I capitalized every word in that fake review, but that’s a path we’ll have to wonder about later. The carbonation I’m greeted with here is light, but noticeable. At least they went the right route when choosing the amount of bubbly to put into this lie. I can’t imagine a heavily carbonated coffee/chocolate soda; both of those things need a smoother mouth-feel than other sodas in my opinion. So now I sit here contemplating what to rate Rocket Fizz Mud Pie. On one hand I could probably finish this bottle, on the other I feel that the flavor listed is a lie. I’m sorry Rocket Fizz, but you had the chance to really knock something out of the park this time. Instead as I threw you the pitch you pulled out a tennis racket. Think I’m a liar? Well do you? That’s fine; in fact I like it when people challenge our reviews. If you want to take the physical challenge buy yourself a bottle of Rocket Fizz Mud Pie at Old52.com. Twist makes a mean mud pie.